They say one man’s rubbish is another man’s treasure and in most cases it’s fairly accurate. We usually let the children have a little bit of money and they have a look around too. Today all they found that caught their eye was the ice cream van! Some of the stalls really were filled with ‘same old same old’, but I’m sure that for some people even those contained hidden treasures. We tend to look for old tools (as they are often far superior quality to some newer ones), old kitchen items such as mixing bowls (as they are also often better quality), games and toys for the children to use in the garden (think cars that are allowed to go in the mud!) and things children need that they tend to lose easily/don’t use that much, such as sun hats and snow suits. At the end of last summer we bought our daughter 5 beautiful sun hats for 50p each, deciding that one could go in the caravan, one could be for in the garden etc. We are a bit discerning with our purchases, in that we won’t buy things if they are tatty or broken, but generally we have been quite lucky. 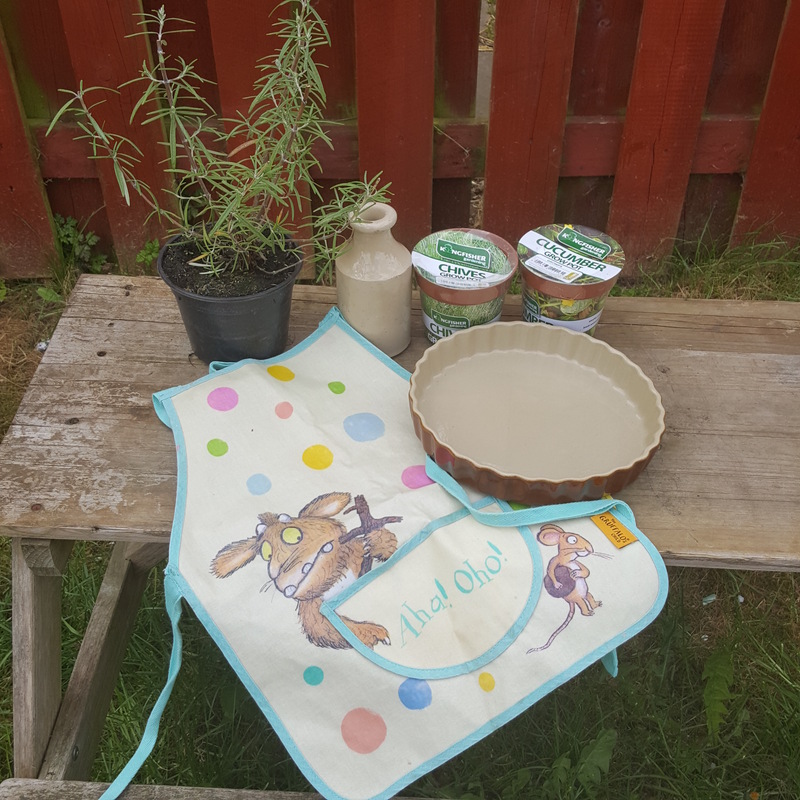 The rosemary plant cost £1, the apron was 50p, the flan dish was £1, the vase cost 50p and the seed pots (chives and cucumber) were 50p each. I also got a Puddle Lane book for my son for 10p but he decided to leave that at his grandparents’ house. I am keeping an eye out for photo props to go with my craft items and thought the vase would be really pretty with a couple of simple flowers in. I really wanted a lavender plant but I will bide my time. I’m also on the hunt for things to use as large planters for a herb garden, I saw a few today but they were just a little too battered and would potential have been dangerous with sharp metal edges. The perfect one will turn up eventually. The other bonus of the car boot sale was that my Garmin told me I’d done 10,000 steps by tea time as the field is three quarters of a mile away, plus the walking around it (twice). It seems a good reason to go again! Do you ever go to car boot sales? What kind of things do you look out for? What’s the best bargain you’ve ever had from one? Thanks, I’m hoping to get good use out of it! Love boot fair season , even if you come home with nothing , you have been out in the fresh air at least , and done quite a few steps apparently! I like to see if I can find lovely fabrics and remake it into something . Fabric seems a popular one, another mum from school posted a pic on instagram of her fabric haul from the boot fair! There’s certainly reassures to be found. Good finds! You’ve inspired me to get a few potted herbs; I haven’t bothered to do that for a few years, and I miss them! Nice vase — I’m sure it’ll be useful. On this side of the Pond, we call car boot sales garage sales or yard sales. And about an hour from where I live, there is a major antique market that takes over a huge field every Sunday. We used to go all the time (I miss that, too) and I found great stuff there. I have no idea how much money that is in dollars and I have no idea what a boot sale is….but it sounds like a great time! We have rummage sales where people sell items they no longer use. Same thing perhaps? That sounds like our flea markets. (which is an odd name as I have never yet seen anyone selling fleas!) Lots of vendors, lots of fun stuff! They also have flea markets here, but only indoors! (At least locally.) I love looking around, I always come home inspired to make things. Husband is a huge fan. I used to go when the boys were little. Good place for toys etc. I always worry where people have been keeping their stock before it goes to the boot sale. I go to about one a year, as I don’t like the wheeler dealer types with the new stuff. I think a lot of dealers go to auctions to buy stuff to sell on. You got some nice things tho’ , plants are always good. I don’t like the dealers too much, but they are handy for the odd thing or two. I tend to avoid the dubious looking stock, you can usually see if things have been stored in dirty places. Clothes etc can be a grey area! Excellent car booting skills 😉 I mainly buy books when I go, although I did once get an exercise stepper for a fiver. Now I keep an eye out for yarn or any goodies that I could pull apart to use the yarn for something else! That’s a good idea. I’m funny about some things, especially fabrics etc as they can pick up odours and you can’t get rid of them. 😞 We have had some cracking book bargains, a lot of our book advent calendar came from car boot sales! Lol! Thank you, it’s amazing what you can find! Nice finds! This apron is too cute! Good bargains! Never been to a boot sale but the list sounds like a good idea. I’d probably come back with a ton of stuff I didn’t need otherwise. We used to go to boot sales years ago – not been for ages! I was wondering whether to go to one soon again – a friend picked up some vintage fabric this weekend at a boot sale – it sparked my interest again. I might have to sneak a trip though – I am sure hubby would say we don’t ‘need’ anything – Mr Oh So Practical and Not a bit crafty! Looks like you all had a fun time and you picked up some great bargains. I can’t wait to go garage sale shopping once the weather gets warmer. We did thanks, can’t resist a good bargain!